Let's face it. To start making money online, you need products to sell and customers who will buy them. ViralPLR helps you do both! Just imagine, getting access to a brand new product every single month which automatically gets rebranded using our built-in rebranding system. You'll literally have 12 products in a year without doing all the nitty gritty of creating the products. Best of all... All the hard work's done for you. The writing, designing, packaging and website have all been done for you. Each month you'll receive a brand new product based around the topic of Internet marketing or self-improvement. Both proven to be hot markets where people are willing to spend a lot of money on and eager to learn. The format of these products are eBooks and typically 30-50 pages long which shares information to solve specific problems such as how to get more website visitors, how to use social media to get the word out and how to improve your mindset. Every single product you'll receive each month is written from scratch by our top fluent English writers, so you don't need to suffer from writer's block and sit frustrated in front of an empty Word document going crazy. We do not recycle old content. So rest assured, you're getting fresh and up to date products every month without any work on your part. We've built a special rebranding system in the members area which will automatically insert your details such as your name and website address you want to promote, in the eBook, landing page and sales page itself. This means that whenever someone sees your landing page, sales page or downloads the rebranded eBook, they'll see your name as the creator/author of the product and website. As a result, it gives you instant credibility and makes you an expert in the field because you now have a product with your name on it. You can even add a biography or use the biography template we provide. In addition, you can add your own recommended resource links at the end of each eBook for readers to go to. And don't worry if you're technically challenged. It's as simple as filing in a few details once, clicking save and letting the system do the rest for you automatically for every new product you receive each month! You'll also get a landing page to accompany each product you receive every month. The purpose of the landing page is to promote and give away the eBook that the ViralPLR system rebrands for you, in exchange for your visitors' details such as their name and email. Each product's landing page is hosted on our web server and automatically branded with your name and optionally your photo, so you don't need to know FTP, HTML, or even worry about web hosting… we do it all for you! And of course, you can update your details at anytime from one convenient location. These landing pages are ideal for those who would like to build a large list of leads, very fast. If you'd like to build a high-value, high-quality list of customers or monetize your existing list even more, then you can do so using the product sales page that's also provided. No longer do you need to mess around with order buttons, shopping carts and delivery tools... with ViralPLR, all you need to do is enter your PayPal email address once and you're set. Each product's sales page will also be branded with your name and optionally your photo, so again there's no messing around with HTML, FTP and all that tedious, technical stuff. Not only will you build your list or make front-end sales, your visitors will also see a special one-time offer upsell, offering additional benefits such as full private label rights to the product. If visitors don't take up on the one-time offer upsell, a one-time offer downsell will appear, giving you more chances of increasing your bottom line. If any members you refer upgrades, you make a commission. We offer generous commission rates. We'll pay 33% recurring membership fees and up to 50% on single products. We also offer backend offers inside the members area where you'll also make commissions on when a member you referred orders. Promoting each product is very simple. All you need to do is log in to the ViralPLR members area, grab your unique URL for the particular product you'd like to promote, and drive traffic to that page ...And we'll even show you simple ways on how to do that, too. When subscribers opt-in from the landing pages we setup for you to promote, your visitors' details are stored into ViralPLR's built-in Email Broadcast System which you can then use to contact your subscribers with your special offers or newsletters. Starting today, you can email your offer or newsletter not only to your lists, but also to at least 50 random members (more on that below) every 3 days with the option to email out every day. Your lists are segmented by product. For instance, once you are a member of ViralPLR for two months, you'll have two segmented lists which you can email out to, as long as you have subscribers generated for the two lists. You can of course send separate email messages to each of your lists. Don't Have A List? No Problem! Starting a list from scratch is difficult! But when you sign up to ViralPLR today, you'll instantly be able to email your offer to 50 random ViralPLR members every 3 days. 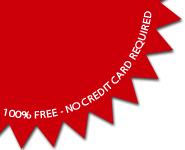 Your offer could be anything - your own product or a product you're an affiliate of. You choose! 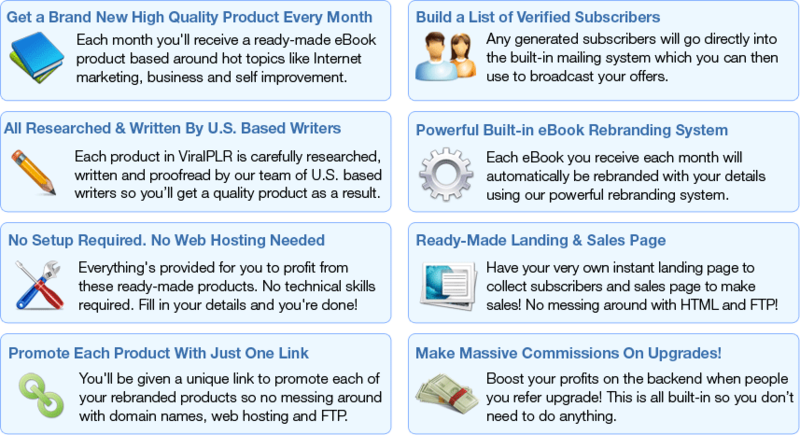 Let's say you recommend 10 to ViralPLR or any of the eBooks you have access to, you not only have the ability to email those 10, but in addition you'll also be able to email 10 randomly selected ViralPLR members, and that way double your list building efforts. Now you can email not just 10 every 3 days, but in addition to that 60 (50 + 10) randomly selected ViralPLR members. Your total list size with zero referrals is 50... with 10 referrals it's 70 and with 100 referrals it's 250 and so one! Can you picture how this will boost your list building efforts? With traditional list building, you build your own list. What we've integrated is the ability for your referals to also build their list. As a result, any subscribers your referals generate will also be in your list, leveraging your efforts. This gives you the ability to not only email your offers and promotions to your 1st level referals, but also to your 2nd and 3rd levels. This makes ViralPLR a powerful list building system if you're looking to build a big, responsive list using the same amount of marketing efforts. And even if you don't have a list to start with, we'll provide you with easy to follow methods & tutorials to get your own list started. Our intention with ViralPLR is to make it so easy for you to use, that you can get it up and running in just a couple of minutes. We've eliminated the pain and hassle of you having to learn how to use FTP, convert documents to PDF, design graphics and create web pages. You don't even need web hosting and domain names. And you certainly don't need to sign up and pay monthly for an autoresponder service..
Everything's built-in the members area so you can start reaping the benefits now and stop wasting time. Looking forward to seeing you in the members area! 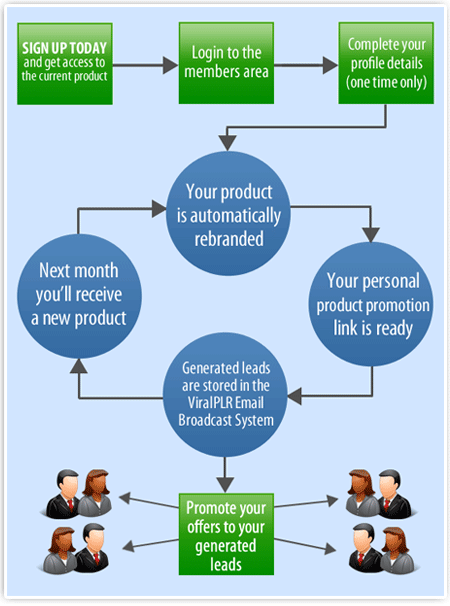 "Extra Stream of Income and Raise Your Reputation"
"You can't go wrong with ViralPLR! 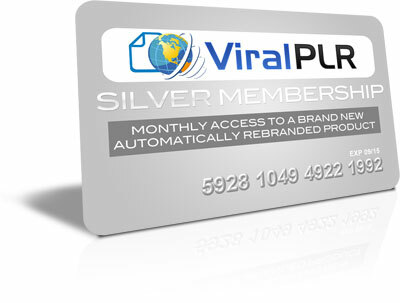 ViralPLR will give you that extra stream of income and raise your reputation because you'll receive a new product every month that's rebranded with your details! What's even better is that you get to build your own list from the ViralPLR products…best of all, I like how I have many "funnels" where my visitors can go through. If you were to ask me, this is all priceless. The owners of ViralPLR are experts at what they do and you can rest assured knowing that you'll be in good hands when you need help. 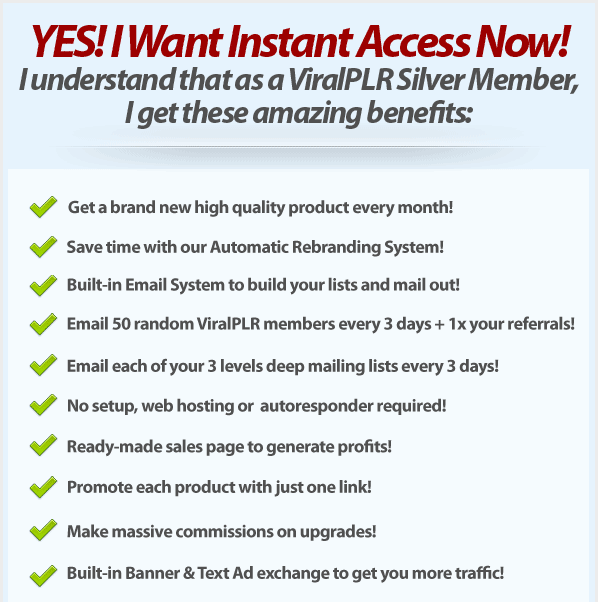 I've been a full-time Internet and networking marketer for over 10 years, and I must say ViralPLR is definitely a site and tool you need to add to your business arsenal. It's easy, turn-key and can't be any easier. 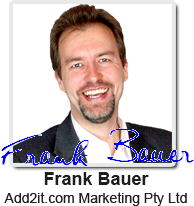 "Extremely Impressed with the Quality and Value"
"I have known Frank for quite some time now, throughout that time I have always been extremely impressed with the quality and value that he has always produced in the online marketplace. However I have to say that this time he really has completely blown me away as this has to be the most impressive website he has produced so far and will offer only the very highest value to all who get involved.